On a company car, it is the owner's responsibility to ensure that it is acceptable to have a separate learner driver insurance policy on the vehicle. The registered keeper is the person that appears on the V5 registration document. If the vehicle being insured Does Not belong to the Provisional Licence holder, the registered keeper must have their own motor insurance policy in place for this vehicle and it must remain in force for the entire period of the Collingwood policy for cover to be deemed valid. 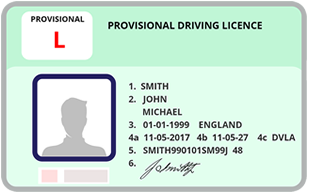 Your Licence should look similar to the one below and state Provisional across the top. UK Provisional Driving Licence Only. If you are a full licence holder from onset of cover, your policy will be declared void/cancelled, premium will be retained and claims will not be paid. Let us know how long you have held your provisional driving licence for. Don't worry if you've only just got your licence - simply enter 0 years, 0 months. Security Question What city were you born in? What is your fathers middle name? What is your mothers maiden name? What is your pets name? In order to provide our services we will collect and use personal data about you and anyone you provide personal data for. The legal foundation for processing this data is obtained on a contract basis, is for the performance of an insurance contract between you and your insurer. We also collect other data from you to enable us as your insurance intermediary to provide our services; these include your mobile telephone number, email address, third party authority details, payment information including debit/credit card details and/or bank account number and sort code. We have a legitimate interest to collect this information from you in order to provide our services including administer your online account. If you choose to withdraw your consent for us to process your personal data provided for the performance of an insurance contract it will result in us being unable to administer your policy. You have the right to withdraw your consent to process information such as mobile telephone number, email address, Third Party Authority, bank details and any other additional information you provide us, however, this may result in us being unable to administer your policy. Here at Collingwood Insurance Services (UK) Ltd we take your privacy seriously and will only use your personal information to administer your account and to provide the products and services you have requested from us. However, from time to time we would like contact you with details of products, services and additional benefits we provide. If you consent to us contacting you for this purpose please tick this box. We would also like to pass your details or persons authorised to act on your behalf or individuals about whom you have supplied data onto other companies/company types, so that they may contact you by email with details of any products, services or additional benefits they provide. If you consent to us passing on your details for that purpose please tick this box. Car Tyre Safety Guide – What’s the point of winter tyres? Collingwood Insurance Services UK Ltd ©2019. All Rights Reserved.